We’re So Bad At Adventuring is a fantasy comedy audioplay about Thornwick and Bob, two regular guys in a fantasy world full of magic, monsters and hijinx galore! Follow them on their weekly adventures as they trick people, steal stuff, hide in barrels, and avoid anything resembling being a hero! Enjoy the introductory episode of We’re So Bad at Adventuring, a madcap comedy about two men who would do anything to avoid an adventure! 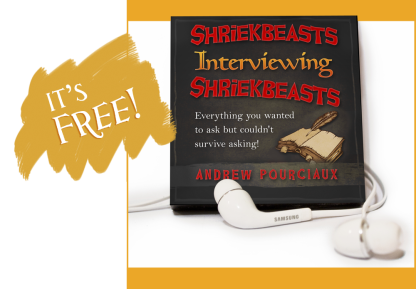 Subscribe to our newsletter to get your very own free copy of our audiobook, Shriekbeasts Interviewing Shriekbeasts, a story of revenge, monsters and a drunken wizard who makes wild, unreasonable demands of our protagonist!